We asked people on Facebook if they get a lot of robocalls, and boy did we get an earful! “I get an average of 35-40 a week. Insanity!” wrote Kathleen. The bottom line is we need stronger consumer protections, from federal regulators and Congress, to combat these calls. Until that happens, CUB has compiled some tips, via Consumer Reports and The New York Times, on what you can do about this insanity. Check out Consumer Reports article on “Latest Ways to Deal with Robocalls”. Spoofing: The robocaller uses software that masks the actual number from which they are calling. In fact, if you have Caller ID, it tries to fool you into thinking it’s a call from a familiar business, like your utility, or even the Internal Revenue Service. Scammers might demand payment of taxes you don’t owe, or threaten to shut off your electricity if you don’t pay a bogus utility debt. Neighbor spoofing: Have you been getting calls that look like they’re from people you may know–from the same area code and prefix? 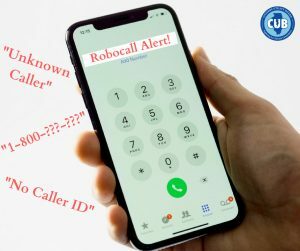 This new wave of robocalls is gaining popularity, as it tricks you into thinking the call could be someone you know or could know in your neighborhood. #2: Join the Do Not Call Registry. Getting on the Federal Trade Commission’s Do Not Call Registry doesn’t mean you won’t get robocalls. Tom, who says he gets up to eight robocalls a week, called the registry a joke. Although we understand the frustration, the Do Not Call list is not a joke. This is an example of good public policy from earnest consumer advocates, and it’s forced telemarketers to get more clever (and slimy) to try to beat it. Those consumer advocates need your help! Being on the registry gives you an outlet to report robo-scammers, so make sure to report them! Don’t answer calls if you don’t recognize the name that comes up on Caller ID. If your home phone has an answering machine, use it to screen calls. (Telemarketers and scam artists are likely to hang up when they hear the answering machine message.) If you do happen to answer a robocall, hang up immediately. Don’t try to call the number back to complain, or to follow their instructions to gripe at a representative. That might lead to more calls. If a robocall offers you the option of pressing a number to stop future calls, that might just be a trick to confirm that your number is “live” and ripe for more calls. There’s another reason to avoid answering: Last year, the Federal Communications Commission warned consumers about a scheme to get consumers to say “yes” (such as when the robocaller asks: “Can you hear me?”) and then using the recording of that answer to allow unauthorized charges on the person’s credit card account. First, find out what services your phone company offers to block unwanted calls. Then, check out third parties. A few popular apps specifically for robocall blocking include: NoMoRobo, YouMail, Robokiller, Hiya and Mr. Number. (Of course, a downside is it could also block calls you want to receive, from new numbers.) If robocalls are taking over your copper landline, you could invest in call-blocking equipment like Call Control Home, which attaches to your home phone, but it can cost $100+. The Jolly Roger Telephone Company uses robot personalities to frustrate telemarketers. The program allows a customer to patch telemarketing calls to a robot, such as “Salty Sally,” that sounds just like a real person, saying “uh-huh” and “OK, OK,” and tries to keep the telemarketer on the phone and frustrate him or her. It’s a service you have to pay for, but if you want a little entertainment, visit the website to hear some telemarketers getting the tables turned on them. Also, keep an eye on where you release your phone number. You actually can get a second number–for free–through apps like Burner, Sideline, Hushed and Flyp. This comes in handy for temporary phone number use, like job applications, online ordering, etc.